We are excited to welcome 17 new Hope Fund scholars this year. 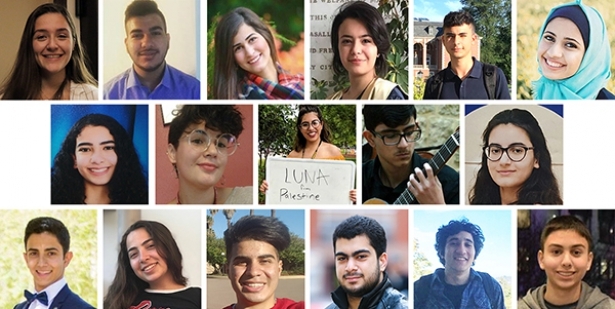 The 10 women and and seven men from Gaza, the West Bank, Jordan, and Lebanon earned generous scholarships from MIT; the Universities of Oregon, Pennsylvania, Rochester; Drexel, Georgetown, Seattle Pacific, Stanford, and Washington and Lee Universities; Bridgewater, Earlham, Gustavus Adolphus, Pomona, Smith, and Williams Colleges; and NYU Abu Dhabi. Two other prospective freshmen are still awaiting their visa decision. Farah Abdel Jawad is a first-year architectural engineering student at Drexel University. Originally from Jaffa, she grew up in Amman, Jordan, where she excelled at the Modern Montessori School. Outside the classroom, Farah is a talented athlete and has dedicated much of her time to community service projects. She is passionate about design and architecture and hopes to use her degree to improve the lives of people in Palestine and across the Middle East. Noor Abu Rabie, an ambitious young woman from Nablus, is majoring in international studies at the University of Oregon, hoping to emerge with strong qualifications to serve in international organizations that aim to assist and empower children in third-world countries. She also hopes to start her own organization to improve, empower, and educate people in Palestine. “My experience so far as a student studying in a U.S university is incredibly rewarding,” she reports, adding that she is thrilled with the connections and friendships she is developing with other students. Malak Abusoud was born in Jerusalem, five days before the beginning of the second Intifada. Raised by a single mother, she studied in the British A-Level system at a French school where classes were taught in Arabic. She also launched a blog, “The Life of a Palestinian Jerusalemite,” to highlight the daily struggles of life as a Palestinian. Malak’s strong academics and intellectual drive earned her a scholarship to Georgetown University, where she plans to major in international political economy. Coming from Gaza, Yousef Al-Amassi considers himself lucky to have a family that always celebrated and supported his academic accomplishments and interests, allowing his intellectual curiosities to flourish, despite the challenges of daily life. Today, Yousef is pursuing his scholarly interests in physics and the natural sciences at Williams College in Massachusetts. The esteemed liberal arts institution is also well suited to enabling him to explore his many other interests and realize his goal of becoming a renowned scientist and well-informed global citizen. Noor Al-Shaer grew up in Rafah, Gaza's southernmost city, in a large family of 10, where she found ample support for her dream to study in the United States. During high school, Noor spent an exchange year in Louisiana on the Kennedy-Lugar Youth Exchange and Study (YES) program. Now she is excited to be in the United States again, beginning her studies at Washington and Lee University. She plans to major in biochemistry, in preparation for becoming a renowned scholar whose scientific discoveries will advance the quality of life for all people. Lora Assi, from Ramallah, is on the premed track at the University of Pennsylvania, preparing for medical school and eventually becoming a surgeon. She is excited to be meeting many students and participating in extracurricular activities, including the Penn Undergraduates for Refugee Empowerment. Looking ahead, Lora hopes to be able to provide surgeries at low cost that are affordable for underserved communities in Palestine and around the world. She also aims to improve mental healthcare across the Arab world. Luna Bseiso, from Gaza, is thrilled to be embarking on an academic and personal journey that has taken her to Gustavus Adolphus College in Minnesota. By majoring in political science, she wishes to emerge with strong qualifications that will enable her to serve in international organizations and help improve the humanitarian situation in war-torn communities, including her own. She thanks the Hope Fund for enabling her to be on track to fulfilling her goal. Berge Hagopian, from Jerusalem, is a student at Pomona College in Claremont, California. A talented classical guitarist, he has won numerous prizes. At Pomona, Berge is majoring in molecular biology in pursuit of his goal of becoming a forensic pathologist equipped with the tools to solve crimes. He is also excited about the opportunity to try new things; that includes a camping trip during freshman orientation at the California school, which he says took him out of his “comfort zone” in a good way. George Kassis, who comes from Beit Jala in the West Bank, is studying neuroscience at the University of Rochester. Driven by his dedication to improve medical services in Palestine and other countries, he endeavors to become a surgeon and researcher in the area of neurological diseases. As a student in the United States, George reports that he is discovering new cultures, ideas, and views, an experience he describes as inspiring. “I am starting to discover myself more and assure my belief that…it is indeed possible for anyone to make a difference in this world,” he says. Salma Khalaf grew up as a Palestinian refugee in Lebanon. Passionate about history and literature, she attended La Cité Culturelle School but her family’s limited finances precluded her from participating in many extracurricular activities. However, she took part in the Model United Nations and the Model Arab League, experiences that nurtured her interest in political science and economics. She also interned with EducationUSA in Lebanon, helping younger students prepare for the SAT and TOEFL exams. Now at Earlham College, she plans to double major in political science and physics, with a minor in French. An ambitious young woman and talented cellist from Gaza, Nicole Khouri currently attends Smith College in Massachusetts. Nicole, who spent the 2016-17 academic year as a YES exchange student in Wisconsin, is excited to be in the United States again to expand her global and intercultural awareness. Smith has a lot to offer to its thriving academic community, and Nicole is eager to take advantage of these exceptional opportunities to grow her knowledge, skills, talents, and connections. Khaled Shehada attends the Massachusetts Institute of Technology (MIT), where he plans to major in electrical engineering and computer science and minor in physics. Growing up in the Jabalia refugee camp in Gaza, Khaled worked hard to excel in his community, learning programming from a young age and contributing to several community service projects and extracurricular activities. Grateful for the opportunity to study in the United States, he is committed to sharing and exchanging his people's stories with the diverse community at MIT. Diaa Sirsawi from Gaza is attending Seattle Pacific University, with plans to major in English. Driven by a fascination with languages and literature, he hopes to one day become a writer – a talent already in evidence when he won the Novell Gaza 2 award in January 2018 for his short stories Scars of Wars and My Cat. He is also passionate about music, having played the classical guitar for nine years, and looks forward to performing with his fellow students at Seattle Pacific. Saad Teeti is from Nablus, Palestine. He spent a year of high school in the the state of Washington through the YES program. Saad currently attends New York University Abu Dhabi, where plans to study computer science.